J.K. Rowling‘s first post-Harry Potter novel is coming soon. 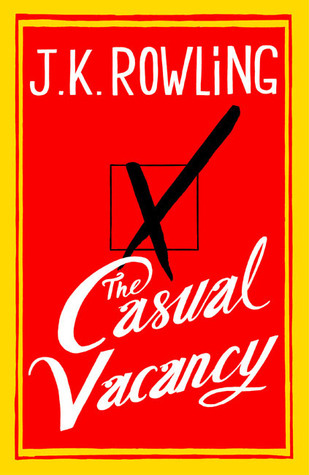 The Casual Vacancy is the writing superstar’s newest work of fiction, and is apparently a standalone work rather than the start of a new series. The literary world is buzzing with rumors about the book and how it might stack up against Rowling’s previous work. I can’t wait, though I find it hard to knowingly invite comparisons between what quickly became one of the best-selling (and most frequently challenged) books of all time and something that would seem to be in a completely different genre. I’m doing my very best to avoid any spoilers, because I want to take on The Casual Vacancy with as open an outlook as possible. People are complaining that it’s too simple, too 70s, too garish. I like it. To add to the excitement (at least for me), the book is releasing days before the start of Banned Books Week 2012. Considering the fuss that Rowling’s earlier works caused in the community of morons who decide that they have to determine what other people read, I can’t wait to see the reactions to this new novel. To sum up, I’m thrilled for next week, even though I’m probably going to have to wait for a library copy to arrive (it’s on hold for me). A fan on goodreads said it best, and so I’ll paraphrase. The topic of the book makes no difference. Rowling’s words are always magical. I’m really looking forward to this book, and praying I can get it and all the other stuff I want that’s coming out next week (AVENGERS, BABY!) but I definitely agree with you. Rowling’s work is always something special. Hence my excitement. I’m willing to wait for a copy from the library, since I got in the line for it relatively early. It’s going to be hard to resist, though.